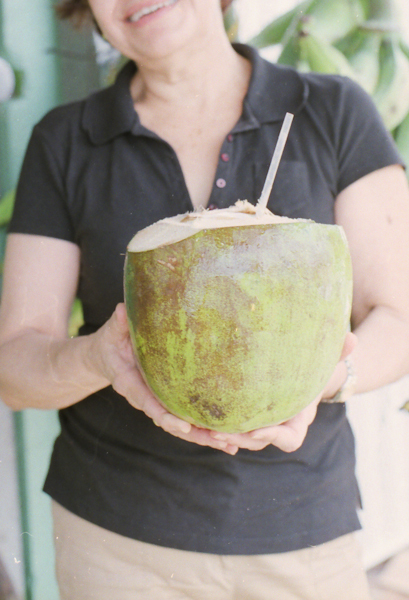 Coconut water…for real this time. The song that goes, “Ain’t nothin’ like the real thing baby,” came to mind when Stacey tried coconut water for the third time. Recall the post we wrote about coconut water and nutrition. We sampled two bottled versions, which tasted, er, interesting. 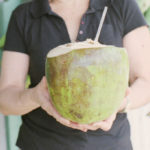 So when Stacey visited Puerto Rico recently, her mother-in-law, Vivian, took her to try the real thing: fresh coconut water from an actual green coconut. 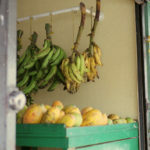 We found this natural treasure in the neighborhood produce stand on Avenida Esmeralda in Guaynabo, a San Juan suburb. At the counter, we paid $1.75 per coconut. The employee who prepares the coconut let us go with him to a room in the rear of the shop to take photos as he pulled out a machete (!!!) and then proceeded to expertly trim the top of the coconut to allow for a straw. Now that is what coconut water was meant to taste like! Compared to the bottled varieties, the taste was fresh and crisp. 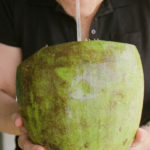 In D.C., bottled is about as close as we can get to the real thing, but if you just don’t want to settle for less than the ultimate experience, you must try the fresh water from a young coconut. The best part about this experience is that once you drain the coconut of the water, there’s more to enjoy! Our new friend with the machete opened up each coconut and made a “spoon” out of a piece of the shell. 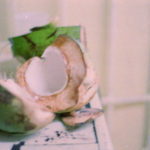 The spoon is used to dig out the white coconut meat. The younger the coconut, the more jellylike the consistency. The gooey-est meat reminded Stacey of egg white. Not terribly appetizing. Most of the meat was firm and even a tad chewy. 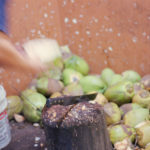 Have you ever enjoyed a fresh green coconut? Are there other exotic or less common foods you have tried either at home or in your travels? A prize (OK, maybe just our adoration) goes to the person who shares their experience with a durian fruit! I have taken the durian challenge. I will send you pictoral evidence! 1 of my brothers and I kinda liked it. banna and pinapple flavors with the most wonderful texture with a deffinate PANG of rotten onion. My third brother wasn’t so fortunate with his response. home processed cured and smoked calve tongue.